Vettai and Nanban, will not be released on the same day. Nanban to release ahead of Vettai ? As on date, Dhanush is the top star among the young heroes in Tamil cinema. It could also be said that this is a golden era for him because of the song Why This Kolaveri Di. At this juncture who is bidding adieu to 2011 thanks five people for his great success. 4. Tamil Nadu press, media, fm radio and national press, media, fm radios. Many films were released this year than the last year. The films listed below are not based on the quality of the films or the release dates. Trade sources say that Nanban and Vettai may not release on the same day after all. There is a buzz that Nanban will hit the screens on January 12th and Vettai on January 14th. This means there would be a one day gap which is very important in the current scenario to rake up the collections at the box office. Both Nanban and Vettai are the most expected films of the year. 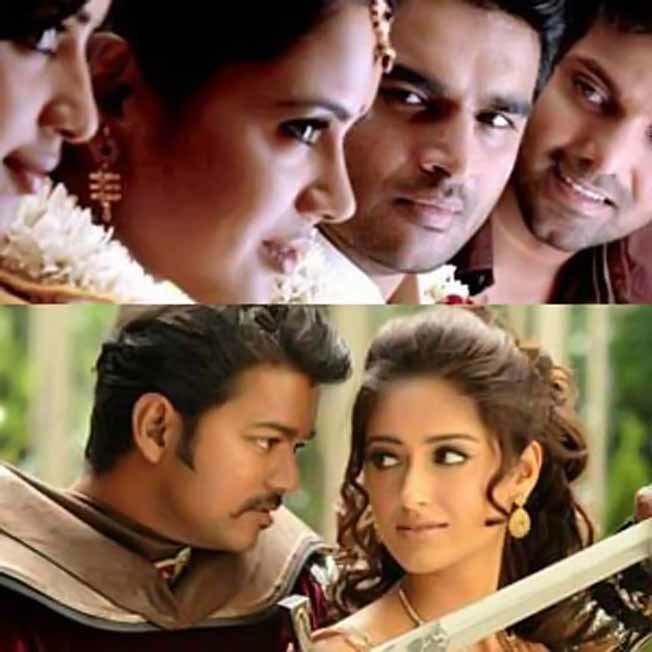 Nanban is directed by Shankar and has Vijay, Jiiva, Srikanth, Ileana and Sathyaraj in important roles while Vettai is directed by Lingusamy and has Arya, Madhavan, Sameera Reddy and Amala Paul. Suriya is always serious about giving his best to what he does. So, when he agreed to host 'Neengalum Vellalam Oru Kodi', the Tamil version of 'Kaun Banega Crorepati', he wanted to do enough homework before standing in front of the camera. "I went to Mumbai and watched personally how Amitabh Bachchan hosted the show. He was amazing and understands well the mind of the contestant. He works really hard and prepares himself well for the show," says Suriya. Suriya also watched clippings of Shah Rukh Khan hosting 'Kaun Banega Crorepati'. "SRK anchors the show with a lot of humanity and he showers care and compassion on the contestants. Both the Big B and Shah Rukh have some lessons for television anchors." Currently busy shooting for 'Maatraan' directed by K V Anand, Suriya is expected to start his next film soon, to be directed by Venkat Prabhu. A sequel to 'Singam' with Hari is also in the pipeline for the actor. 2011's power list (female) saw some ruthless oustings, deserved comeback and new entries. Tamannaah, Trisha, Nayanthara, Shriya, Sneha and Reema did not figure anywhere in our list and a new bevy of young skilled huntresses were supposed to take over in 2011. At the beginning of 2011, We gave a list of who the sexiest pin-up girl of 2011 in Kollywood will be? The young actresses who were contenders for Number one slot in 2011, in our list were Hansika, Shruti, Taapasee, Oviya, Karthika, Amala, Varalakshmi. But sadly, none of these girls could create a massive impact. No one knows how to stay at the top better than Anushka. While it may be a tad mystifying as to how she is in our list, with just two average films Vaanam and Deivathirumagal, the answer may well lie in her sheer redoubtable star power. She is on the wish list of Rajini, Kamal to all top stars who want her to ink their projects. She is doing Karthi's untitled film directed by Suraj, Selvaraghavan's Irandam Ulagam with Arya, Vikram's AL Vijay actioner Thaandavam. Kajal Aggarwal may not have a single release in Tamil in 2011, but she has emerged as Anushka's biggest competitor. She is doing films with two hot 'n'happening stars, Maatran with Suriya and Thuppakki with Vijay. Hansika started the year with Maapillai, followed it up with Engeyum Kadhal and ended the year with the hit Velayudham. She came out with flying colours but is yet to be a part of a blockbuster hit. She has STR's Vettai Mannan and Udhayanidhi Stalin's Rajesh directed OKOK coming up for release, which is sure to take her places. Lakshmi Rai made a wild card entry with two blockbusters Kanchana and Mankatha but it was Anjali, Ananya, Richa and Inaya who made an impact by proving that they can act and hold immense potential for 2012. Trisha proved that she is a big-budget survivor by being a part of the blockbuster hit Mankatha in which she had to share screen space with Lakshmi Rai and Anjali. Taapsee's Aadukalam was her trump card but critics lambasted her Vandaan Vendraan which was a b-o turkey but one flop does not make or break a career. She is yet to sign any new projects in Tamil. Shruthi Haasan had a dream debut with 7 aum Arivu, a role that was too heavy for the young girl to carry it on her tender shoulders. Shruti may have some proving to do on the acting chops front,but her screen presence is unmistakable. Her much-hyped Aishwarya Dhanush directed 3 releases in 2012 and that will be the real test. Karthika was touted to make waves especially after her debut film Ko became a super hit. But there was no buzz around her and her decision to be too choosy and stay away from limelight made her a dampener. Oviya and Amy Jackson were wiped out while lady luck didn't smile at Varalakshmi in 2011 as her debut film Poda Podi is yet to be completed. Nayanthara and Reema Sen did not have a single release and news about their impending marriage in 2012 has affected their market. Shriya who had a b-o turkey in Routhiram is sending feelers to all the directors but is yet to bag any project. Tamannah had Siruthai a hit and Venghai in 2011 but the actess has more or less said goodbye to Kollywood and is concentrating in Telugu. Kajal 's lawyer had argued that the unauthorised use of her profile had adversely affected her career, and she lost several contracts with other companies. Top actress Kajal Aggarwal won a major battle against a hair oil company for using her photo in an ad, after the contract period expired. Now Madras High Court has restrained the hair oil company VVD & Sons from using advertisements featuring her. Kajal had dragged the company to court stating that it continued to use her ad even after the expiry of the one year contract. Karthi and Ranjani: Heartthrob Karthi broke the hearts of his female fans by entering the wedlock. And the lucky bride was Ranjani, an MA gold medalist from Stella Maris College, Chennai. Karthi's wedding was in typical Kongu style; the actor wore a traditional white silk dhoti and shirt; the bride Ranjani was seen in a yellow Kanchivaram silk saree. The wedding was followed by a star studded reception in Chennai. Mamta and Prajith: Actress-singer Mamta Mohandas got married to her childhood sweetheart Prajith Padmanabhan on Wednesday (December 28) at a simple wedding ceremony held at Kozhikode. Prakashraj and Pony Verma: National award winning actor, producer and director Prakashraj was married to Bollywood choreographer Pony Verma in a gala affair in Mumbai on August 24. Prithviraj and Supriya: Probably the most dramatic wedding of 2011! Hansome hunk Prithviraj tied the wedding knot with a Mumbai-based news reporter Supriya Menon in a low-profile ceremony on April 25. Shakthi and Smrithi: On October 31, ace filmmaker P. Vasu's son Shakthi married Smrithi, a B.Com graduate from Stella Maris in grand function. Selvaraghavan and Geetanjali: After ending his two year married life with actress Sonia Aggarwal, director Selvaraghavan tied the knot to 23-year-old Geethanjali on July 3 in Chennai. Yuvan and Shilpa: Ilayaraaja's youngest son Yuvanshankar Raja mariage ceremony with Shilpa, a B.Pharm graduate from University of Adelaide, was in deed a family affair at Tirupati on Sept 1. This is Yuvan's second marriage; his earlier marriage with Sujaya ended in divorce. The latest buzz in the trade sources is that Shankar's magnum opus Nanban which has Vijay, Jiiva, Srikanth , Satyraj,S.J.Suryah,Ileana and Anunya in the lead will be released on January 12th which gives two days ahead of other two releases Vettai and 3. 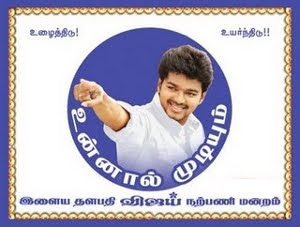 Nanban has also cleared the censor board with a clean ' U' certificate .The entire album has become a huge hit among the listeners giving building more expectation around the movie. A insider reveals that the production house Gemini Film Circuits is busy getting the theatres for a solo release for these two days which may give Nanban a flying start comparing to the other two releases. Unlike Hollywood or even Bollywood, there are no authentic collection figures or agency tracking movie revenues. Everything in Kollywood as far as b-o collections are concerned has to be taken with not a pinch, but a spoon of salt. It is an industry driven by star fans who claim that every film of the star is a super hit and collections are more than any Hollywood blockbuster! Under these circumstances, TamilKey has put together a top ten based on trade reports. We will not be reporting the actual figures, as every star worth his salt will go out of their way to prove that their film is a hit. Please note in an industry where actual figures are difficult to obtain, a flop can be made into a hit with a bit of star power thrown in. Drawing up a list of commercially successful movies, Sify will only rate the film as a Blockbusters, Super Hits and Hits. These are the films selected after talking to trade analysts, theatre owners and distributors. You are welcome to disagree with the sify list. 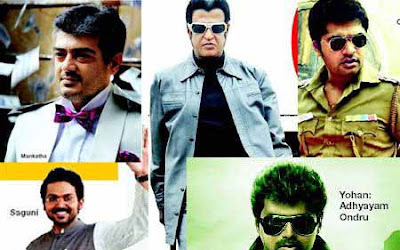 Why Factor- The film became a blockbuster due to the star power of Ajith and his fantastic opening. Added to that it was a solo release and got a five-day holiday weekend. Why Factor- A complete mass masala entertainer which had comedy laced with horror, glamour and sentiments. Worked wonders with lady audiences and kids, though it carried an 'A' certificate! Ko – Correct mix of peppy songs, action, lush locales and KV Anand's content and packaging which was different. Siruthai – The Karthi- Santhanam comedy combo clicked big time along with mass masala content. It proved that a remake of a proven hit with local nativity is always a safe bet. Engeyum Eppothum- Debutant director Saravanan film on a bus accident with two parallel love stories with Jai- Anjali & Sarva- Ananya in the lead along with fresh music worked wonders. Velayudham- Ilayathalapathy Vijay's one-man show had the audiences lapping it up. 7aum Arivu- Aggressive promotions and Suriya's charisma worked in favour of the film. Deivathirumagal- Smart marketing, Vikram's life-like performance with wonder kid Sara clicked. Aadukalam- Dhanush's award winning performance, Vetrimaran's script & GV's music helped. Vaanam- STR's opening plus good content along with noted performances made the film a hit. # Please note films like Kaavalan, Avan Ivan and Mayakkam Enna were moderate hits. Get the Best Online Bus Ticket Reservation Services in all over India in one step with Ticketgoose. TicketGoose is not only providing the Online Ticket Booking Services, it is providing services like what are the places to visit in each and every state. We had Travel agents to contact in each area for all states. Bus Ticket Booking Get the Best Online Bus Tickets Reservation Services with Ticketgoose. Your Online Bus Tickets Booking is just a click away!